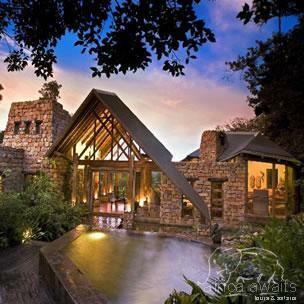 A symphony of stone, wood, glass and water high above the floor of the magnificent indigenous forests of the Garden Route, between Knysna and Plettenberg Bay. Elevated wooden walkways meander through the trees to ten exclusive and very private suites, all with plunge pools. The seductive structures rise to heights exceeding six metres, each one a harmonious combination of craftsmanship of ancient times and indulgent luxury of modern convenience. Discover the romance and magic of Coastal Africa. Eastern and European flavours blend with the cultures of Africa to reflect in the tastes, rhythms and colours of the hand crafted fittings and superb cuisine. 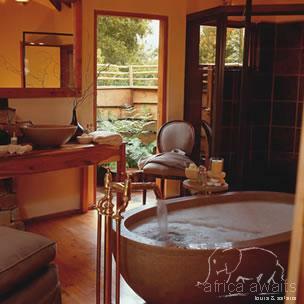 Each suite boasts its' own sitting room with wood fire, bedroom, spacious bathroom and outside shower. The private pool with observation deck and sun lounges, complete an unforgettable experience. Large open suspended decks overlooking the forest canopies add a different dimension to dining and sunset viewing. The dinners are superb, the imaginative cuisine reflects the diversity of South African cultures accompanied by a cellar that stocks some of the best wines that South Africa has to offer. 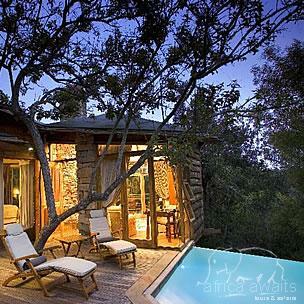 With your holiday, safari or business trip from in to Tsala Treetop Lodge in The Garden Route.